Juan Martin Del Potro during his match against Denis Kudla, Tuesday at the Delray Beach Open. DELRAY BEACH — For Juan Martin Del Potro, Tuesday night couldn't have turned out better. He was back on the court playing competitive tennis for the first time in more than a year. His surgically repaired wrist seemed no worse for the evening's wear and tear. 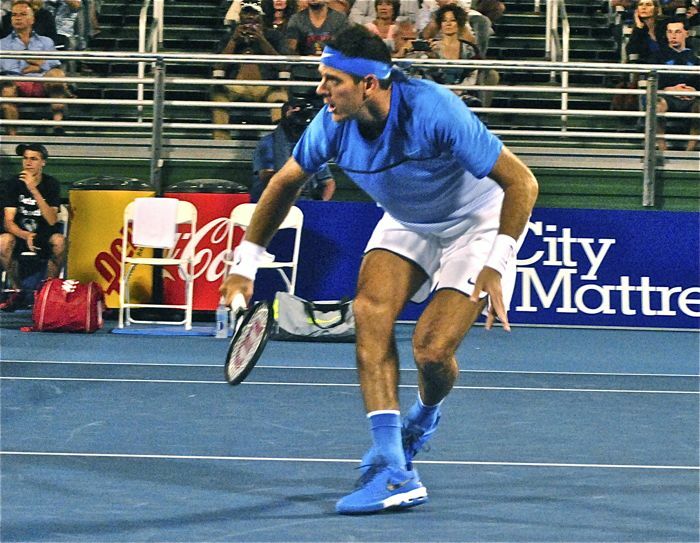 Del Potro of Argentina, defeated American Denis Kudla 6-1, 6-4 in a first round match at the Delray Beach Open. Kudla was the tournament's No. 5 seed. "It's more important to be here than the score," Del Potro told the crowd after the game. "I want to say thank you to all of you for supporting me all this time." Del Potro's return helped attract the largest session crowd of the tournament, many coming to cheer for him. "I felt like i was playing in Buenos Aires in front of all my people." Del Potro last played a match in March a year ago. He twice had surgery on his right wrist, the second coming in June. The Delray tournament director invited Del Potro to compete in this year's event as a wild card entry. It's the second time Del Potro has played at Delray — he won in 2011 after coming back from surgery on his left wrist. As recently as 2009 Del Potro ranked fourth on the ATP World Tour and had defeated Raphael Nadal and Roger Federer to win the U.S. Open. He played with the power he once had, with serves regularly hitting 125 mph, even 130 mph, but his backhand isn't what once was. But he said it was in "the middle of a process" to get it back. "Today, for being my first match after one year, it was OK.
"If I do well, stay healthy, maybe I can be dangerous again." Also Tuesday, Kevin Anderson, the tournament's No. 1 seed, withdrew from play because of injury during his first-round match with American Austin Krajicek 7-6(3). Anderson, of South Africa, lives in Delray Beach and came into the tournament ranked 14th in the world. Mardy Fish of Vero Beach remains the only top-seeded player to win the Delray tournament. He did it in 2009. Anderson wasn't the only seed to fall. Bernard Tomic, the second seed, lost to American Rajeev Ram 7-6(3), 6-1.